I live in a semi-arid climate in the Texas Panhandle. I rather enjoy the landscape, I want to emulate the beauty of the outdoors, indoors, and I’ve found that succulents help do just that. They just look so great in the kitchen or office, though I’m biased because that’s exactly where I keep mine 😉 For those of you who don’t have the luxury of living in this type of climate or who just want to make your indoor cacti flourish, I have a few helpful tips to keep you from killing those beautiful succulents! I can’t be the only one who’s been told that succulents are basically indestructible (am I?). I’ve found that that popular myth is simply not true. After having a little chat with the Neal, owner of Canyon’s Edge: Native and Xeriscape Bedding Plants, I discovered that this is a common problem and can be nipped in the bud (heh) at the plant store. When selecting succulents for indoors, stick to green varieties whenever possible: crassulas, agaves, and aloes all add a sweet touch. The truth is: the darker and more colorful the succulent, the more sunlight it needs to survive & thrive. This doesn’t mean that you have to have a boring arrangement. 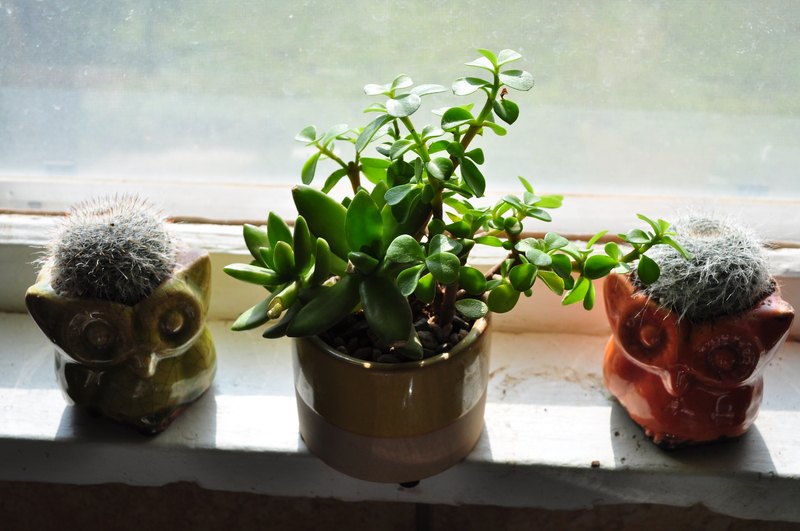 Try to spice it up with different shapes, sizes, and other cacti (like my adorable moon cactus peeking out of my owls). The great thing about these plants is that you can plant them relatively close to each other. However, keep in mind that if they’re going to be kept indoors indefinitely, you need to space them out a bit more to allow them to soak up all of the sun. Sunlight and dry air is important. Like I said, if you don’t have the climate I do and you can’t grow these puppies outside, make sure you put them by a window and allow them as much sunlight as possible. When it’s cold, make sure they’re not right up against a window. Water your succulents once their soil is completely dry. 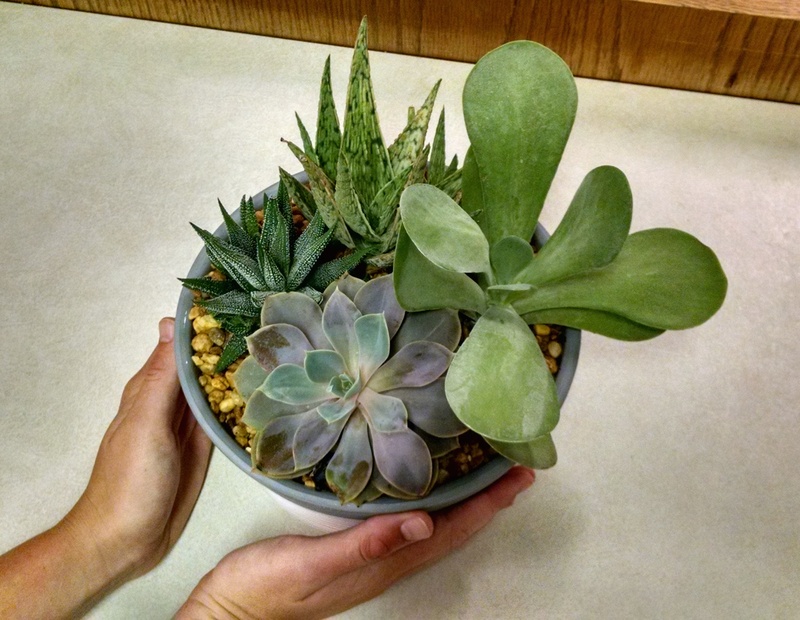 In the summer, succulents go through a growth spurt, and like a baby, need lots of nutrients and light. Instead of just dumping a cup of water on them once a week, wait until they’re dry and then give them a good soaking. Succulent garden at work taken by my awesome co-worker, Steve Ely! Speaking of soil, make sure you pick something gritty & sandy. Where they grow naturally, you won’t find luxurious soil, trust that. The pot you use matters. Be sure to choose an unglazed, easily drainable container. Most times, terra-cotta pots with a hole in the bottom will do the trick! Now, watch those suckers grow! Pay attention to your plants. Is it looking a bit yellow? You’re probably watering it too much. Is it leaning toward the sun? Then, you’re probably not watering it enough. See, it’s not that hard to keep them alive, but they do involve more work than everyone was letting on! What other tips to you have for keeping them thriving? Do you have your own succulent garden? I am a succulent and cacti lover and I have most of my cacti inside cos of our climate (I live in Belgium) what I learned over the years is that succulents need more water than cacti and when you can give them a vacation outdoors in Summer they’ll love you for it, but you can’t put them from indoors to outdoors in the sun right away they need a shady place for a few days, then half sun for a few days and then you can put them in the sun, you’ll see them trive and smiling !!!! Thanks for the tips! They are just such beautiful plants 🙂 I just wish my climate allowed me to grow food – but at least I can grow lots of succulents haha!